Batting: SO Dowrich 46* off 133 balls, Shai Hope 44 off 70 balls, KOA Powell 38 off 68 balls, Jason Holder 40 off 88 balls. Bowling: CBRLS Kumara 3/67 in 18 overs, RAS Lakmal 1/38 in 16 overs, Rangana Herath /41 in 16 overs. 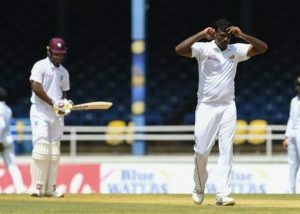 West Indies captain chose to bat as the pitch had some cracks and it was expected to aid the batsman. 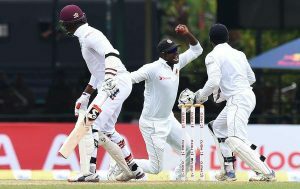 Lakmal was able to swing the ball and in his 2nd over completely outsmarted Brathwaite as the West Indian opener nicked the ball to Dickwella and West Indies lost the first wicket. Smith was now joined by Powell on the crease as both batsmen looked to build a partnership to counter Sri Lanka’s pacers. 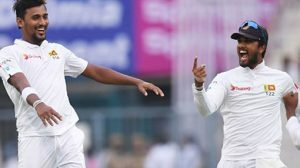 However, they were vulnerable to the line and length on which the Sri Lanka’s bowlers were pitching. Sri Lanka was also brilliant in the field which resulted in Devon Smith being run-out by Dickwella who collected the ball from Chandimal and whipped the bails off in a jiffy. Devon Smith was now joined by Shai Hope and both these batsmen shared a solid partnership of 40 runs which frustrated the Sri Lanka’s bowlers. However, Kumara who had been expensive in his first four overs, returned for his fifth and got Powell out with a beautiful delivery to shatter the leg stump of Shai. Shai Hope was now joined by Chase and both batsmen shared a 54-run partnership to take West Indies total above 100. Hope was on 44 runs at this point and looked well on the way to get his fifty. But, Kumara was in no mood of letting the batsman get to this hall mark as Kumara’s short delivery got him a wicket in his 9th over. 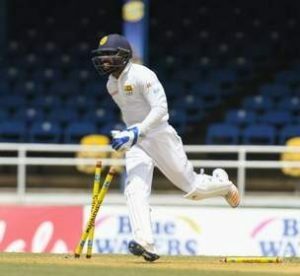 Dowrich joined Chase on the crease and this stand had only gone to 13 runs when Rangana Herath, the most experienced bowler Sri Lanka’s line-up struck to sent Chase back to the pavilion. The West Indian captain, Jason Holder now joined Dowrich on the crease and the pair shared 90 runs between them as West Indies passed the 200-mark. At this point, Holder was on his way to a well-deserved fifty but, Kumara didn’t allow that to happen as he nicked the ball to Dickwella. Day 1 ended with both teams having shown a fighting spirit, although Sri Lanka was a little better poised.